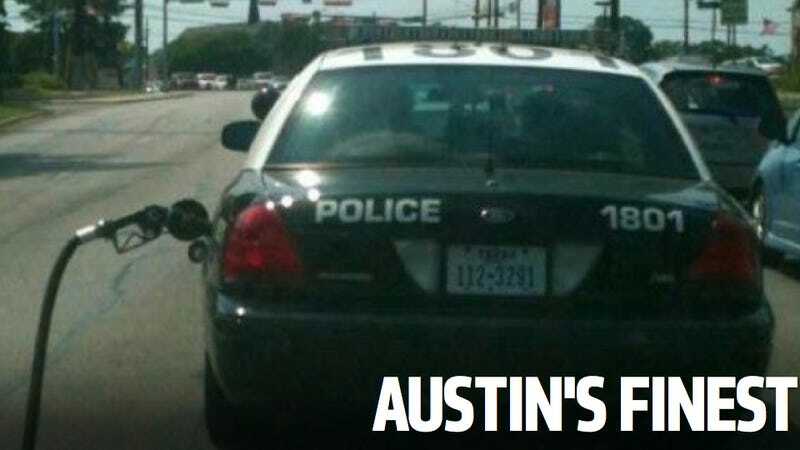 Anyone who went to the University of Texas, or has a friend who did, has probably now seen this picture of an Austin Police Department squad car pulling a nozzle behind it on Facebook. It's both real and hilarious. We imagine the officer driving the car has also seen this photo. In fact, it's probably taped to their locker right now. According to The Austin-American Statesman, this happened on Tuesday when a police car pulled away from a gas pump. A spokesperson for the police said no damage to the car or the pump occurred on account of a system in place for just this type of incident (it isn't the first time we've seen such an event occur, but it's the first time with a police car). That it happened in Austin makes perfect sense. It's a town where the police have to be a little professionally oblivious in order to avoid having to spend all their time writing Minor-in-Possession tickets.